Has the Clovis Comet been Found? Some 12,900 years ago, a sudden and significant change in the climate of our planet caused the destruction of a massive amount of fauna in the northern hemisphere (1). This event may have been the basis for the many Flood myths spoken of by so many ancient cultures around the world, including within the Bible (2). It has been suggested that this event may have been triggered by the impact of a substantial meteorite, which melted substantial sections of the prevalent Ice Sheets covering much of the northern hemisphere at that time. This immense melt would have resulted in raising ocean waters, and destructive tsunami covering much of the land not already under ice. The main problem with this idea has always been the lack of a smoking gun in the form of an impact crater. If the meteorite had struck the ice sheet, then the crater could have been mostly carved into ice, which was then lost in later times when the climate warmed at the end of the last Ice Age. Now, it seems, there could be serious evidence of a major impact having occurred during the last Ice Epoch (3). It may have taken the form of what become known as the 'Clovis Comet', which is thought to have impacted at the point of the Younger-Dryas boundary condition. 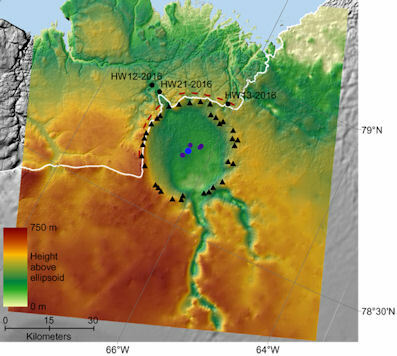 A 31 km wide, circular crater has been discovered under the Greenland glacier, by researchers scouring over old NASA airborne radar data. The crater-shaped depression in the bedrock lies beneath 1 km of ice. The crater's size is suggestive of an object that was greater than 1 km across. Worth digging out? That would be quite an ask, given the kilometre-think sheet of glacial ice in the way. However, searching the surrounding area for impact debris, in the form of small, ejected meteorite fragments, could yield a better picture of the nature of the impact, as well as narrowing down its age. This planet was ejected into interstellar space. It may have become the now famously sought-after Planet Nine, still hanging around in the distant depths of the solar system far beyond the Kuiper belt (3). 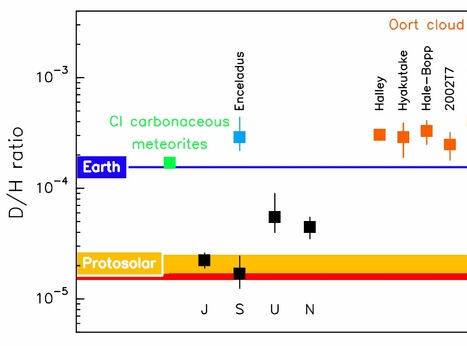 The annual review article also addresses the timing of the late, heavy bombardment - a seeming massive spike of catastrophic impacts with kicked off some 4.1 billion years ago, some time after the solar system seems to have settled down after its initial formation. Reading through this section (1), it seems that the author argues that the late, heavy bombardment was triggered early on, and that the effect we can see on the lunar surface was part of an on-going process. In other words, the dating of the cataclysm may have much to do with the formation of the lunar crust, which hides the record of impacts prior to 4.1 billion years. This seems to be the implication. This seems to be a fudge, if my reading of this is correct. Instead, the lateness of the late, heavy bombardment seems to be an anachronism which does not sit well with the earlier migratory movements attested to in the Nice model. The computer simulations all work on the basis of what is contained within the solar system. Yet, it is also recognised that the ejection of worlds from early solar systems is littering interstellar space. 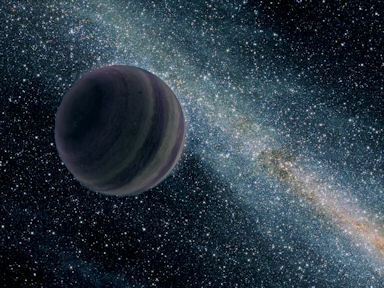 In which case, it is not too much of a reach to argue that a rogue, missing planet may have made an incursion into the solar system from beyond, triggering the late, heavy bombardment. Our solar system, after all, is not a closed, isolated unit. Instead, it floats in what appears to be an increasingly complex galactic medium. The Earth should be a dried out husk of a world. Yet, despite the blasting of solar radiation it received when in it unshielded, primordial state, it has retained, or gained, copious amounts of volatile water. How? For a long time, scientists pointed to comets, with their supposed 'dirty snowball' compositions, as the culprits. Early impacts (of which there were many) delivered the required water to a desiccated Earth. Except that the comets aren't all that wet, it turns out. The water they do have doesn't really match that of the Earth's either. Scientists can compare the isotopic composition of water: the ratio of regular hydrogen atoms (H) to “heavy” hydrogen (also called deuterium, or D), known as the D/H ratio. The D/H ratio of water in Earth’s global ocean is about 150 parts per million (ppm). In comparison, water in a range of comets varies from 150 ppm to 300 ppm. In comparison, the D/H ratio of water in asteroids is about 140 ppm, which represents a much better fit with the water on Earth. This has led to increased speculation that earth received its water from asteroids, rather than comets. Unfortunately, things aren't that straightforward. Where an object forms with the solar nebula and emerging protoplanetary disk could have an impact upon this ratio. But so could the gravitational force holding onto the lightest element, hydrogen, which, with oxygen, combines to make water. Because deuterium is twice as heavy as its simplet cousin, hydrogen, it won't be driven away so easily. So, the more volatiles are driven away from a given planet or planetoid, the greater the D/H ratio fo what's left behind. To illustrate, Jupiter and Saturn can hang on to hydrogen really well, providing a source of water when combined with oxygen. The D/H of hydrogen in the solar nebula is very low compared to Earth, asteroids or comets: 21 ppm . This is in keeping with the gas giants. because their gravitational powers enable them to hold onto primordial hydrogen, the D/H ratio is maintained at levels close to the solar nebula these behemoths formed out of. by contrast, small bodies, like asteroids, don't have anywhere near that pulling power, and their volatiles are likely to be driven off (as can be visibly seen in the case of comets as they approach the warmth of the Sun from deep space). The terrestrial planets, as well as the ice giants, lie somewhere in between. Could the Earth have held on to some of this solar nebula hydrogen early on? To investigate this tidea, a team from Arizona State University’s (ASU) School of Earth and Space Exploration (SESE) conducted computer simulations to try to work out whether Earth rocks, deep within its mantle, could have incorporated hydrogen early on, which could then combine with oxygen to produce an abundance of sub-surface water. 'ingassing' of volatiles into the early Earth from the solar nebula could therefore provide a potential source of water, despite the driving forces trying to rid the Earth of this early, lightly bound material. But, as ever, this is all rather convoluted. A simpler solution, which seems to be almost universally ignored as a possibility, is that the Earth formed beyond the snowline of the solar system, and migrated inwards to its current position, already laden with its water. This would readily explain the evident similarities between the D/H ratios of Earth and chondrites from asteroids. 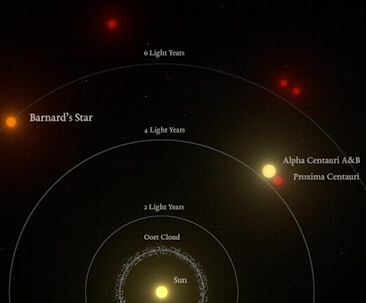 Barnard's Star is already remarkable. It is one of the fastest-moving known stars, moving through space towards us at around 500,000 km/hr. It will make its closest approach to the Sun around 11,800 AD, coming within 4 light-years. So, for a while, in about 10,000 years time, it will become our closest star. Even now, it's only about 6 light years away. It's a red dwarf, perhaps twice as old as the Sun, perhaps older. Because it's been burning it's nuclear fuels very slowly, it may be older still. It's certainly not very bright, and this has made trying to find planets around it that bit more difficult, despite its relative proximity to us. That odd interstellar object that whizzed around the Sun last autumn is continuing to cause major headaches for astronomers. Its hyperbolic trajectory is flinging it away from the Sun so quickly that any chance of studying it in more detail has been lost. Recently, astronomers have tried to point the powerful Spitzer telescope towards it, with little success. The fact that Spitzer couldn't observe it provided an upper limit to 'Oumuamua's size (1), although this size is very much dependent upon its shape. It seems that that shape is highly elongated, complicating the size issue considerably. Still, this retreating object is self-evidently not 'warm', otherwise Spitzer would have had better chances to spotting it. In a different, recent paper published in the Astrophysical Journal Letters, Harvard professors Shmuel Bialy and Abraham Loeb have proposed several theories to explain ‘Oumuamua’s strange behaviour (3). This includes the possibility that this visiting object is artificial, a topic which Abraham Loeb was quite comfortable about discussing during a BBC radio interview (4). The high albedo of this object may make that seem even more likely. The problem with this object is that its changing trajectory indicates that it's out-gassing, like a comet, but at the same time it is not visibly out-gassing. So, it looks like an interstellar asteroid, but moves like a comet. That may suggest that it is making use of some kind of propulsion. At the very least, it's not behaving in a 'normal' way. Regrettably, it is now too far away from us, and too small, for astronomers to collect more data about this fascinating object. As such, the nature of 'Oumuamua is likely to become somewhat legendary. In my forthcoming new book, 'Darker Stars', I have set out a great deal of what we know, and what we don't know, about this bizarre object. A great many locations have been proposed for the vanished civilisation of Atlantis, as described by the great Greek philosopher Plato in his book Timaeus, c. 360BCE.. The legendary island of Atlantis was located beyond the 'Pillars of Hercules' (i.e. the Straits of Gibraltar), in the Atlantic Ocean, and disappeared beneath the waves about 9000 BCE. Notable speculations about the location of this mysterious island include: the Greek volcanic island of Santorini; an archipelago of submerged islands just west of Gibraltar (1), Bimini in the Caribbean, and even a civilisation buried under the Antarctic ice-sheet (2). A new suggestion has been recently set out in the U.K. newspaper, the Daily Mail. A British team of researchers believe that they have found a compelling trail of evidence suggestive of Atlantis. The location? In the Parque Nacional de Doñana in Spain, north-west of the Strait of Gibraltar, and just north of the port of Cadiz (3). The argument goes that this area was once a large inland sea, peppered with islands which sank as a result of tsunamis. Archaeological remains in the area have been attributed to the Romans and Greeks, but the researchers at the Yorkshire-based satellite imaging firm Merlin Burrows think that they pre-date these ancient civilisations by at least hundreds, and possibly thousands of years. "Maritime historian Tim Akers, head of research at Merlin Burrows, said not only had they discovered Atlantis, but also found the people were incredibly advanced. He said 'laboratory analysis' of material recovered from Spain showed evidence of a type of cement not seen before, as well as ancient advanced metallurgy. A greenish blue patina has been found covering some of the ruins which tests have shown is an ancient combination of metals. The use of the term 'Atlantis' triggers fascination and ridicule in equal measure. Homer's city of Troy, as described in the Iliad, was once considered mythical. But we now know that the city existed, at Hisarlik in Anatolia, Turkey. Today, it is a UNESCO World Heritage site. Perhaps, one day, a similar attribution will be made for the mythical sunken civilisation of Atlantis.